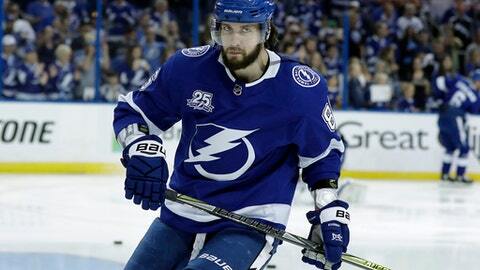 TAMPA, Fla. (AP) The Tampa Bay Lightning have signed forward Nikita Kucherov to an eight-year contract extension worth an average of $9.5 million in salary and annual bonuses. The team announced the deal Tuesday. The 25-year-old would have been a restricted free agent next summer with one year left on a deal that will pay him nearly $4.8 million for the 2018-19 season. Now he is set to stay with the Lightning through the 2026-27 as the team’s highest-paid player once the extension kicks in after next year. The two-time All-Star had 39 goals and 100 points with a plus-15 rating last season. He was third in the NHL in points, sixth in assists and tied for ninth in goals. He averaged 19:49 in ice time to lead all forwards for the Lightning, who lost in Game 7 of the Eastern Conference finals to Washington. The deal also means the Lightning have locked up a core group of players younger than 30 years old. Tampa Bay now has Kucherov, captain Steven Stamkos, defenseman Victor Hedman, left wing Alex Killorn, left wing Ondrej Palat, center J.T. Miller, center Tyler Johnson and defenseman Ryan McDonagh all signed through at least the 2021-22 season. ”My thought is we get the opportunity to open negotiations after July 1 of their last year of their contract, let’s sit down with the players and their agents, and see if we can get something done early,” Lightning general manager Steve Yzerman said Tuesday in a conference call with reporters.